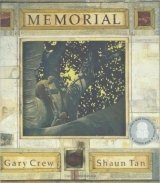 Internationally acclaimed author, Gary Crew, and multi-award-winning illustrator Shaun Tan have created a powerful picture book to help us all remember. When the soldiers return in 1918, a memorial tree is planted... 'Lest we forget'. But generations later, what do those who pause in the shadows of the tree's immense branches remember? A message we should never forget. Memorial serves as a reminder of the lessons to be gained from the past and examine the significance of conservation, respect and remembrance.